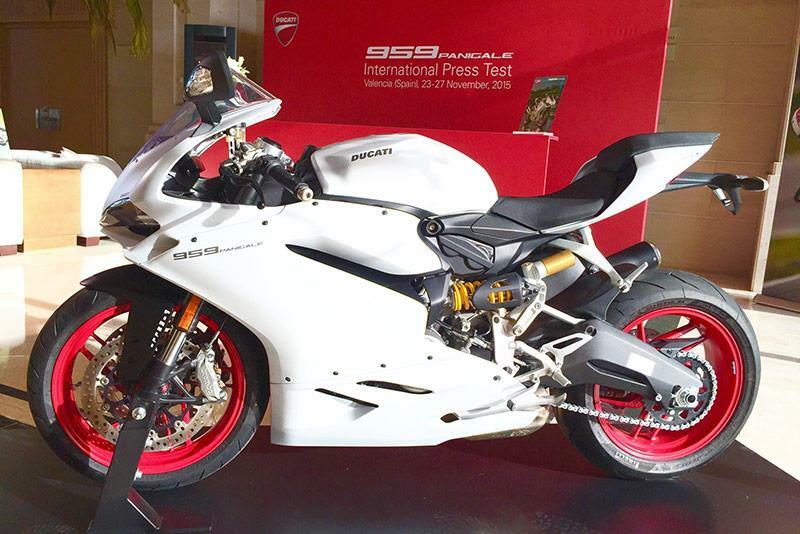 Today we are at the launch of the new Ducati 959 Panigale in Valencia. Follow this page throughout today for live updates, our first impressions of the new bike and to find out how it compares to the current 899 that it’s replacing. I’ve just finished my first riding session on the 959 Panigale (on Pirelli Diablo Super Corsa SC2 race rubber) and it’s more of the same from Ducati’s ‘Super Mid’ machine...in a good way. Without putting it back to back with the 899, it’s hard to notice the 2% improved power to weight ratio, or the extra torque, but it should be more obvious on the road when the throttle isn’t on the stop everywhere. The 959 doesn’t accelerate viciously like a superbike and here at a big track like Valencia it doesn’t feel crazy-fast, either. But, getting the best out of the 899 and this new 959 is all about letting go of the brakes early and carrying corner speed like a Moto3 racer. The faster you flow through corners, the better it feels. Agility is between a 600 and a superbike, electronics and quickshifter is superb and the Brembos work well, although not on par with the 1299’s earth-stoppers. We’ve got another three sessions to explore the 959’s voracious appetite for corners and if it’s anything like the 899, it’ll get better lap after lap. Will the 959’s extra power and weight move the ‘baby’ Panigale more towards 1000cc sportsbike territory, or will it still have the 899’s sublime balance and delicate speed. Today we find out.